Buttermilk biscuits are made in different ways with some very minor variations on the ingredients and amounts. This is a very simple biscuit and I am sure you will get a perfect result every time. Remember to use quality ingredients and cold butter and it is a surefire recipe! Before getting to the ingredients, I have a daunting episode to share. Have you ever tried teaching your child to drive? Then you will totally understand what scare I am going through! My daughter is learning to drive! I anticipated and dreaded that day. Eventually, it happened! AGHHH!! it is inevitable!!! *sigh*! I tried to escape the trauma by explaining how a driving school is her best option. She stubbornly dismissed it saying that she wanted to learn the basics and not look like a dumbo in a driving class. Then, she pestered me to let her drive as she had passed the written test. I was nervous and tried to evade but she was persistent. I, shivering with fear and gripping the seat for dear life, made her drive around a very silent, residential block. Both of us were stressed, heated and furious by the end of that very short drive. After some coaxing, she decided to join a school and it was music to my ears. So after theory lessons, her instructor started her in-car sessions. Every time the instructor came to pick her, I waved happily and watched the car roll off. I heaved the biggest sigh of relief! Ah, not so soon…! After a few lessons, she wanted to practice at home and asked me to sit with her. I immediately had a panic attack and persuade her father to go with her. One Sunday morning, they went driving and returned as total nerve wrecks and mad at each other. She swore that he had no patience and would never drive with him. He pointed out all her mistakes and said she cannot pass the test if she wouldn’t listen to him! Okay, that was worse than I imagined! I had to wave the peace flag to restore some calm. Finally, I had to yield. So very reluctantly, I took her driving. Now, I have to mention this, our family car is a huge, heavy monster with extremely stiff parts. It obeys only the master and there are some buttons I am not yet very familiar with. She got in the car and tried to reverse cheerfully, but the dragon would not move. I told her to disengage the hand brake. She yanked it with all her might and the car jerked heavily before moving. Her heart popped out of its cavity and she sat there shaking. When she saw I was nervous too, she mustered some courage and moved to the road. When she drove close to the edge, I leaned towards her as if it could change the wheels. Every time, there was a need to brake, my leg involuntarily pushed the unavailable pedal on my side and screamed, SLOW DOWN! She gave me strict orders not to create panic or shout orders at her as it made her very nervous. I sat heart pounding, at the edge of the seat like watching a horror movie. Each left turn, I held my breath and tried not to jump out, but it was nerve wracking. By the time we were back, both were drenched in sweat and our blood pumping at a record high. In a months time, she learned proper maneuvering and tricks to reduced my anxiety. Her driving has improved, now. I am a bit confident to sit in the passenger seat and watch her steer with grace but I do not want to do this co-driver business again! We bought lunch at Popeyes to enjoy the Louisiana style preparation. It came with biscuits and my daughter enjoyed its flaky texture. Immediately, I decided to make some at home to stretch the taste experience. I adapted this recipe from Martha Steward’s recipe here. If you take a closer look you may find I have reduced the ingredients and changed quite a bit but the result was very tasty buttermilk biscuits. I have added some herbs as I have to use them before this season ends. This recipe creates 16 fluffy, light biscuits. In a bowl, whisk together flour, baking powder, baking soda, salt, and sugar. Using a knife, cut in cold butter and with fingers rub into flour mixture until it resembles coarse meal. Pour buttermilk in the center and stir just until a raggy dough comes together; the dough will be sticky. 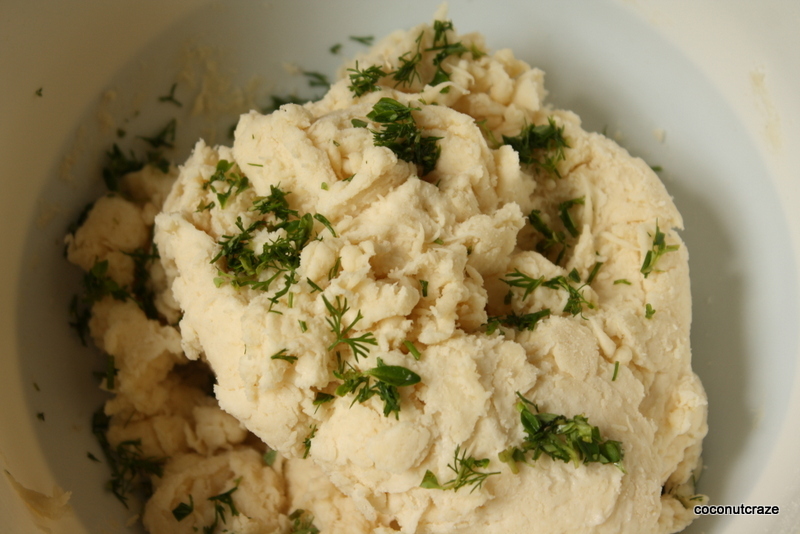 Add herbs and mix with the dough. Transfer to a lightly floured work surface and gently roll dough to flatten. Use a cookie cutter and cut biscuits out of the dough. Gather the remaining scrap and flatten it and cut biscuits out of it. Place biscuits on prepared baking trays and bake until top browns, 12 t0 15 minutes. Brush with butter after they are taken out of the oven. Cool on wire racks and serve warm. 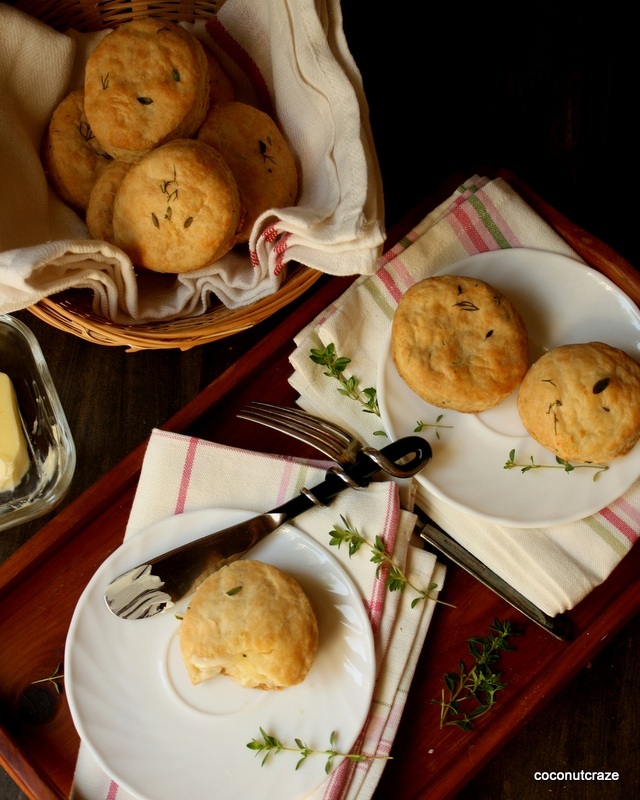 Cold butter is the secret ingredient to get perfect biscuits. Be sure to work fast and a gentle touch to ensure flaky biscuits. These are fluffy, buttery, golden biscuits with a crunchy top. They are lovely with a smear of butter or jam. You can make breakfast sandwiches if you make bigger biscuits using a larger cookie cutter. Biscuits can be made a few days ahead and stored for a week. Reheat to make them crispy before eating. 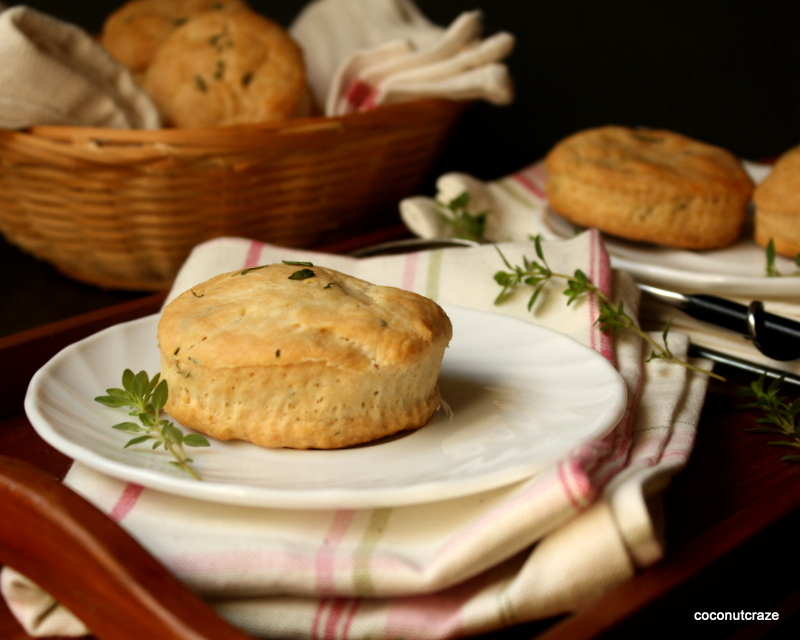 I hope you try these beautiful buttermilk biscuits and enjoy them! This entry was posted in Appetizer, Baked, Breakfast, comfort food, Easy recipe, Finger food, Snack, Vegetarian and tagged Biscuits, breakfast biscuits, buttermilk biscuits, buttermilk herb biscuits, buttery biscuits, comfort food, easy recipe, finger food, fluffy flaky biscuits, snack. Bookmark the permalink. Love the addition of herbs. 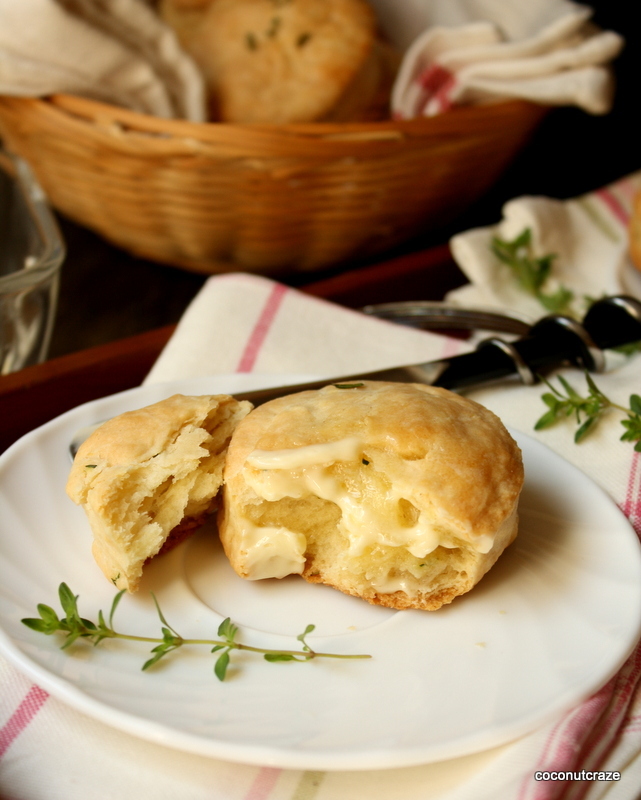 Flavorful biscuits. Thank you, Srividya! This is an easy-peasy recipe! Thank you, Sonal! That’s so sweet of you to say it! 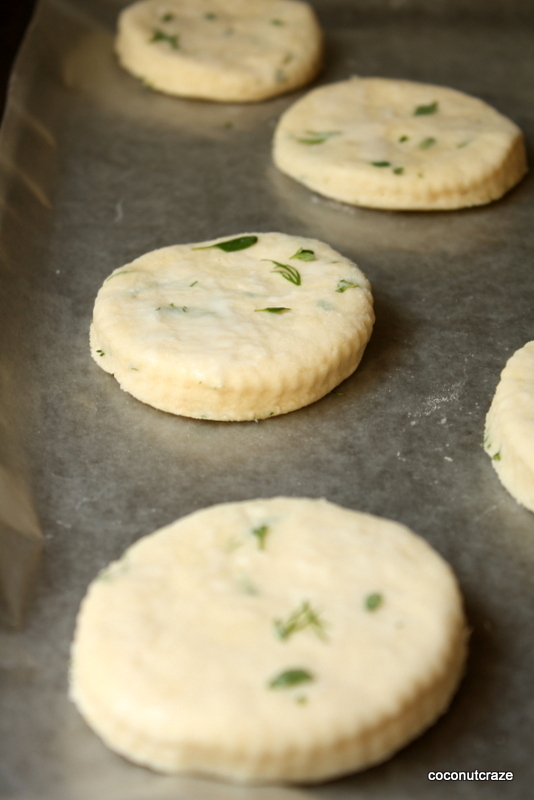 biscuits or anything carbs are my weakness..so looking at these herb buttermilk biscuits, i want some right now. Thank you, Dixya! I am glad you like these biscuits! So lovely of you to drop by. Please do visit again! That’s deliciousness, need them now! I am sure you will like its delicate flavours. Remember to eat it warm, though! Gorgeous herb infused biscuits, they look so flaky and tender, I can only imagine eating them with a huge dollop of butter. Oh my, don’t remind me of those driving days – does she not automatically take Driver’s Ed in school? Maybe they don’t have that in TO, but over here that is part of the school curriculum. The funny part though? Both our girls live and work in NYC now and have had no practice driving for the last few years, so it is like driving all over again for them. 🙂 Hopefully your daughter will be a pro in no time. No, there is no Driver’s Ed in Ontario Schools. They have to learn it privately. It is almost done. Thinking of her driving alone makes me nervous, now. I can totally relate to how you feel when your daughter is learning to drive…..going through the similar feelings but just the difference being that though I’m not doing the co-driver business, the anxiety remains the same…..lol ! 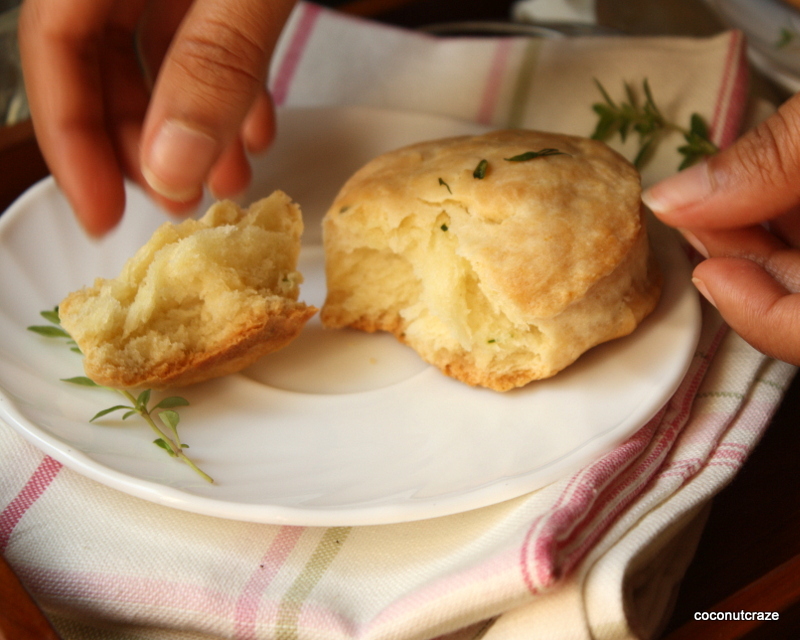 !…..Btw..the herb infused buttermilk biscuits looks super scrumptious! !..perfect with a cup of coffee!! There are different thing to worry at different stages of life! I am going to learn to relax, as my son points out! Looks we share a lot of similarities,,,my son too!! Oh, I have the same going on here! Sometime back, when we were in the car, a guy jay walked across the road ahead and my son said, ‘Speed up, you get 100 points for hitting a pedestrian’! Bad game influence!!! About my daughter’s driving…I have to wait and see! The ridges along the edges of your biscuits look so lovely- my cutter has a straight edge… 😦 They look delicious too! Thank you, Josette! Those wavy edge cutters are easy to find. I got a set of four at a dollar store! You have a sturdier backbone than me. My husband worked with the kids on driving and then it was driving school. My patience wouldn’t have allowed me to try! These biscuits look delicious! I’ll be pinning them! As the learning progresses, it is much more relaxing. Today she drove me to the shopping mall and I really enjoyed it! Thanks, Julie! When I look back, it is funny but at that moment it was like a roller coaster ride! Our son learned it faster…he had a pedal under his table and a game wheel for a long time! So he handles real driving with ease. What makes me scream is his experiments like sudden acceleration, testing the maximum speed and even skidding in snow…just to show off!